>>> now to presidential politics . in a moment we'll talk to gop contender and former house speaker newt gingrich , but first, nbc's chief white house correspondent and political director chuck todd has the latest on the race for the white house . hey, chuck, good morning. >> good morning, ann. it's been over a week since the allegations of sexual harassment against herman cain surfaced. while the candidate has made no progress in ending the controversy, there's not a lot of evidence it's hurting him politically, even as he finds himself unable to change the subject. >> don't even go there. >> reporter: can i ask my question? 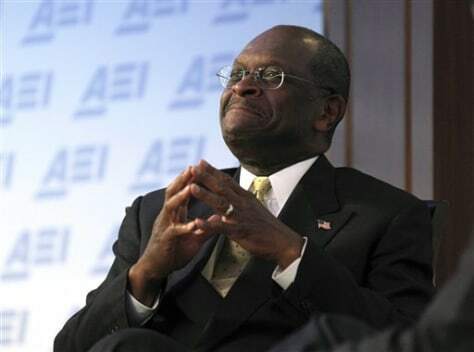 >> reporter: the questions about herman cain 's past behavior aren't going away. >> where is my chief of staff. >> please send him the journalistic code of ethics . >> reporter: then he's not exactly walking away from them either. >> can you get to the mike? >> we are getting back on message, end of story, back on message. >> reporter: he alluded to the story again during a friendly debate with fellow candidate newt gingrich . >> what's been the biggest surprise to you out of this whole experience? >> the nit-pickiness of the media. >> reporter: gingrich, who has his own beefs with media coverage suggested these complaints about the press have not served him very well. >> it's a very hard business and it should be. this is the presidency of the united states and if you can't get through the campaign, you sure can't govern. >> reporter: a thing echoed by fellow republican candidate michele bachmann . >> everyone loves him. who doesn't? he has a great personality but this is the leader of the free world that we're talking about. >> reporter: so far cain seems to have maintained his support and co-front-runner status to the surprise of some establishment republicans. >> it's an unconventional year. the response has been unconventional. i think one of the things you're seeing, you're not seeing yet is as much damage as you would expect in other years or with other campaigns. >> reporter: this unconventional year with no republican breaking out of the pack has some people asking whether there might wind up being a third party candidate. on sunday, ron paul , who ran as a third party candidate in 1988 said he might not support the eventual republican nominee but ruled out a third party run for himself. >> i have no intention of doing that. that doesn't make any sense to me, to even think about it, let alone plan to do that. >> because i don't want to do it. >> well the appeal of a third party is just one of the things that we test in our special " wall street journal " poll debuts tonight and tomorrow morning . tomorrow officially begins the one-year countdown to election day . Republican presidential candidate Herman Cain speaks participates in an event at the American Enterprise Institute for Public Policy Research (AEI) in Washington. Cain does not shy away from using race as a talking point, much to the consternation of liberal and independent blacks. He said blacks have been "brainwashed" into voting for Democrats in large numbers and shuns the term "African-American," preferring to call himself an "American black conservative."